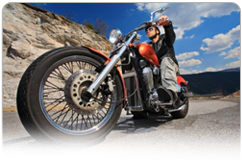 Even though finding a company to insure a motorcycle may be difficult, Standard Insurance Agency is here to help you. We can provide you a comprehensive insurance policy for your motorcycle with a variety of specialized coverages -- all at a competitive rate. Standard Insurance Agency can offer coverage for most motorcycles including: sport bikes, touring bikes, mopeds, cruisers, dirt bikes, ATVs, vintage motorcycles and even custom choppers. Best of all, we are able to offer insurance with a host of discounts to save you the most on your motorcycle insurance in CT.